No. 38, Jalan Balakong Jaya 6, Taman Industri Balakong Jaya, 43300 Balakong, Selangor, Malaysia. 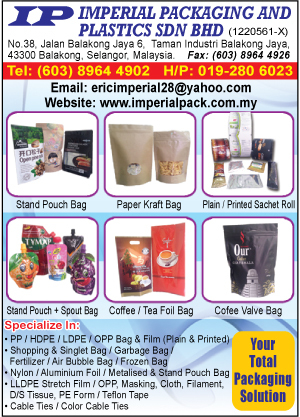 Imperial Packaging And Plastics Sdn Bhd specialises in the production and decoration of high-quality in supplying laminated plastic in bag form, rolls form for fully automatic packaging material such as Aluminium Foil, Nylon, Opp, Pet, Cpp, Metalise, Retort- Cpp, PP, Hdpe & Ldpe..etc. 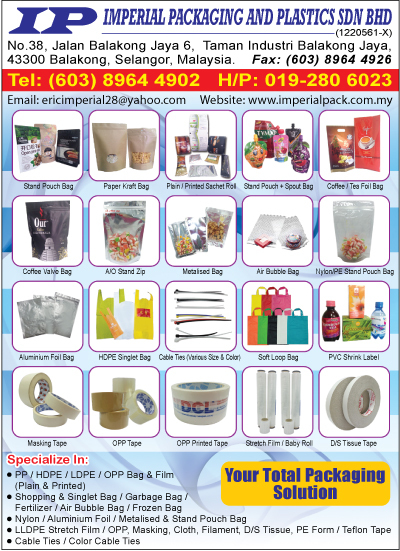 In a consumer-driven environment distinctive packaging is vital, and Imperial Packaging And Plastics Sdn Bhd offers unrivalled expertise in developing packaging solutions for markets where quality and style are critical to a product’s success. Markets such as personal care products, pharmaceutical, pet care, food and household products. We have an extensive range of over 1200 standard products, and are also able to offer custom moulding of exclusive designs with a low cost of entry. Virtually everything is conducted in-house, on site - from concept design, through toolmaking to production, artwork and decoration. Besides providing concept branding for packaging needs, we had broadened our services into providing consultancy for our client on methods to improve product shelf life. The break through for this technology is by re-combination, using different types of laminated materials so as to provide better moisture barries protection and lesser oxidation transmission rate. Our aim is to deliver the fastest, full service, high-quality packaging in the industry. Methodically quality control procedure is compulsory to ensure superior product finishing. Our team of skilled staffs are trained to handle into achieving quality manufacturing standard at every stage during production. Today we have successfully originated more than 12 different types of models for packing food products such as biscuits, cookies, 3 in 1 coffee, bread, candies, spices, curry paste, instant noodle, raw rice, snacks & nuts, ice-cream, moon-cake, dehydrated seafood, liquid detergent, frozen seafood, and pastries such as roti paratha mini bun & etc.Whether you choose from our standard range or require a bespoke exclusive solution, we will be there to help you every step of the way with design support, technical analysis, advice and continued after-sales service throughout the product lifecycle.